This post is sponsored by BabbleBoxx.com on behalf of Alexia. All opinions are mine alone and partnerships like this help keep the blog ad free for your enjoyment. I hope you love the product and the Maple Rosemary Spatchcock Chicken with Roasted Grapes as much as I do. Make an entrée the whole family will love with this Maple Rosemary Spatchcock Chicken with Roasted Grapes. 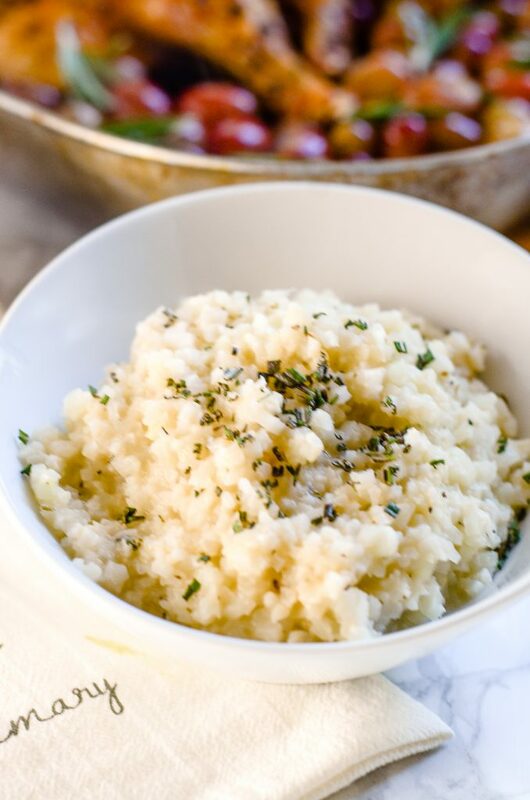 Serve it with Alexia premium starch alternatives for a low-carb and gluten-free meal. My family eats more vegetables than anything else. Almost to the point where it has become a game to figure out new ways to add even more vegetables to each meal. As a result, low-carb meals tend to be a standard dinner in our home. Whether you’re like us and love your veggies, you’re looking for more ways to get your kids to enjoy vegetables (who doesn’t need this? 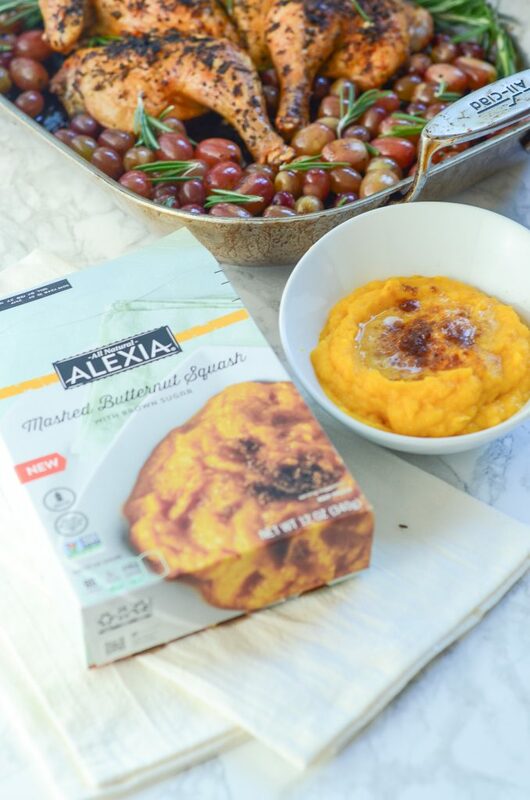 ), or you’re trying to cut out some unnecessary calories, Alexia foods has you covered with their new line of frozen side dishes; all of which pair nicely with today’s recipe: Maple Rosemary Spatchcock Chicken with Roasted Grapes. If you shop at Safeway, Kroger, Meijer, Giant Eagle, or many other fantastic grocery stores, then you’ve probably already seen Alexia frozen foods before. 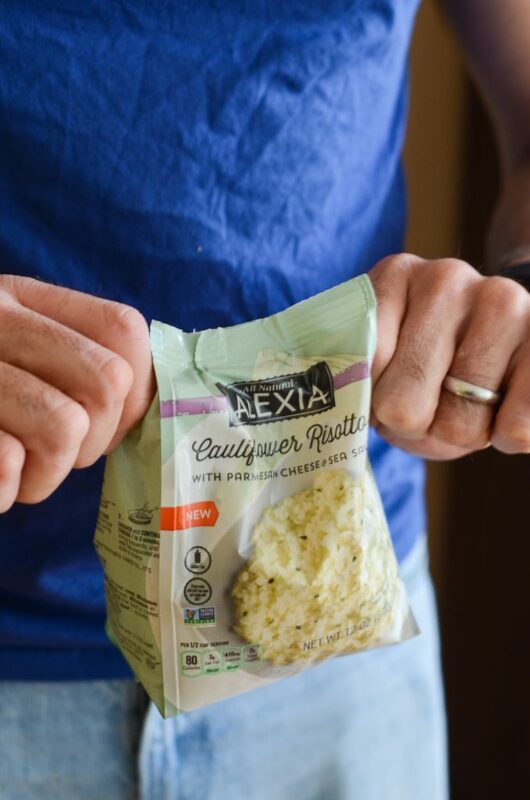 If you haven’t tried them yet, then get ready to be inspired because not only are they delicious and high quality, they are non-GMO project certified, gluten-free, and use organic dairy ingredients. Want some more information about these complete side dishes from Alexia? Check them out HERE. Personally, I’m in love with their new starch replacement side dishes; especially right now as autumn is coming at us in full force. The flavors are just too delicious to pass up on! Not to mention, they are ready to cook right out of the container and done in 10 minutes without needing any additional ingredients! 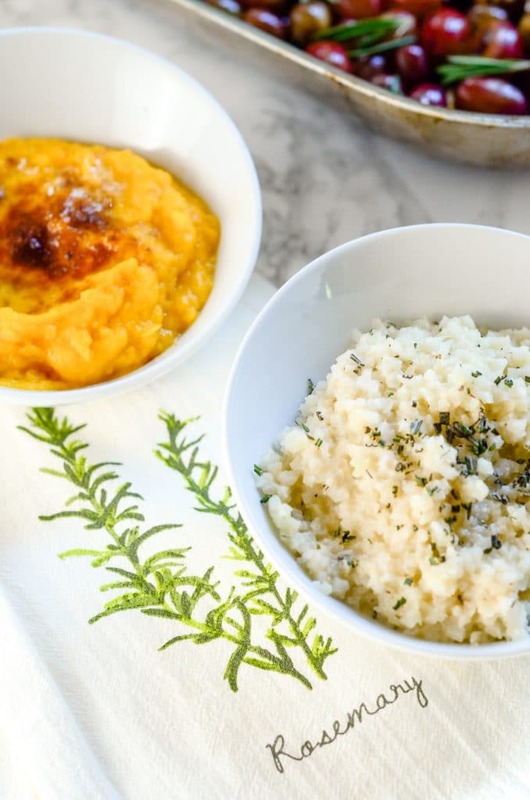 These are two of my favorites: the Cauliflower Risotto with Parmesan and Sea Salt and Mashed Butternut Squash with Butter and Brown Sugar. Using Alexia’s premium side dishes allows you more opportunity and time to brush up on these cooking techniques need to make this Maple Rosemary Spatchcock Chicken with Roasted Grapes recipe shine. How To Buy & Store Fresh Herbs. Find out how to keep that rosemary as fresh as possible for the most flavor impact. Chicken Stock 101. After you’re done roasting your chicken, turn it into a glorious golden nectar by making your own chicken stock. How To Roast. Learn the difference between baking and roasting, and how to use it to your advantage. 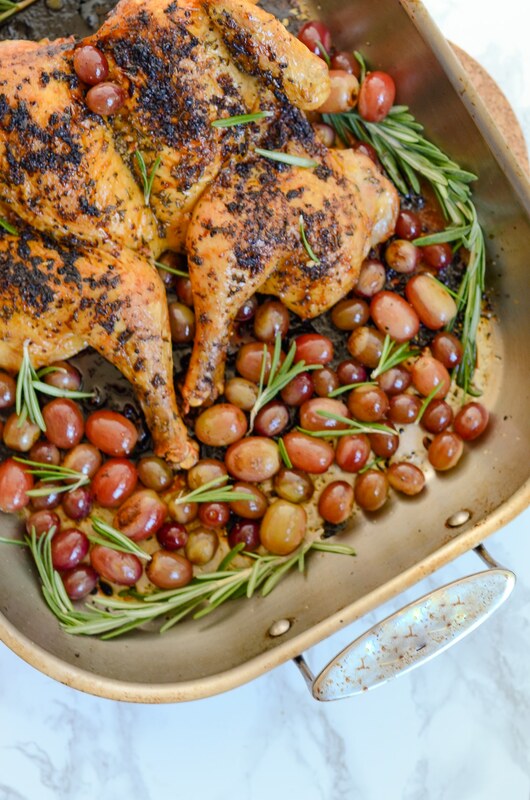 If you have leftovers of this Maple Rosemary Spatchcock Chicken with Roasted Grapes, they can be stored in the refrigerator for up to 5 days in an airtight container. If you want to remove it from the bones before storage, you’ll have better luck if you do it while the chicken is still warm. It’s a lot harder to debone a cold chicken. The same goes with the skin. The roasted grapes don’t need to be kept separate from the chicken, but if you choose to keep the skin on the chicken for storage, the moisture from the grapes may make it soggy. Place the chicken in bottom of an oven-safe pan so that none of the pieces are overlapping. Tent the pan with aluminum foil, leaving one corner open and bake for 20-30 minutes or until the chicken is reheated throughout. Remove the pan from the oven and add in the grapes. Let rest for five minutes then serve. The residual heat from baking should heat up the grapes without it overcooking them into mush. If you have super large grapes however, give them a stir about 3 minutes after you add them to the pan to help. Grapes are in season right now, so this is the perfect time to make this Maple Rosemary Spatchcock Chicken with Roasted Grapes recipe, and Alexia complete side dishes takes some stress off of you. 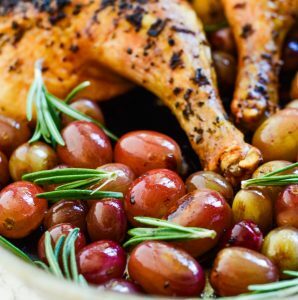 Get your free printable grocery list fro this Maple Rosemary Spatchcock Chicken with Roasted Grapes HERE. 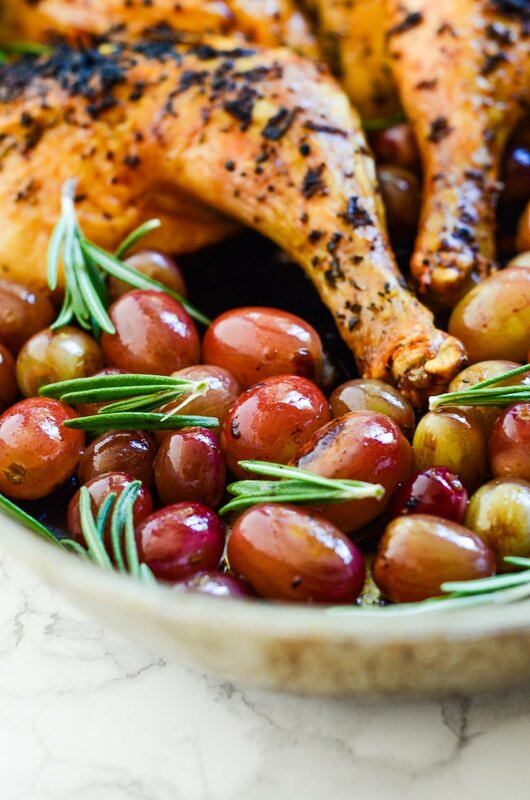 This grocery list has everything that you’ll need to make this Maple Rosemary Spatchcock Chicken with Roasted Grapes recipe. To help in making grocery shopping simple, each ingredient is listed in easy-to-find grocery store amounts. If there is no amount specified, that means that you can buy the smallest (or largest) container available and still have plenty left over. Make an autumnal entrée the whole family will love with this Maple Rosemary Spatchcock Chicken with Roasted Grapes. It's dairy-free, gluten-free, low-carb and cooks in one hour. Place an oven rack in the upper third of the oven and preheat the oven to 500°F. Stir together the maple syrup, garlic, and mustard and set aside. Remove the whole chicken from the package and take out the neck and giblets from inside the cavity. Pat the chicken dry inside and out and use a pair of sharp kitchen shears to cut out the spine. Open up the chicken and place it breast side up on a cutting board. Place your hand on top of the breast bone and use considerable force to push down until the breast bone breaks and the chicken lays flat. Transfer the chicken to a roasting rack placed in a roasting pan or sheet pan and tuck the wing tips behind the breast. Rub in just enough olive oil until the skin has an even coating and season the chicken with ample amounts of the salt, pepper, and minced rosemary. Place in the oven and bake for 40 minutes. Remove the chicken from the oven and use a pastry brush to brush the skin of the chicken with the maple syrup glaze. For extra flavor, use a utensil to gently lift the skin on the breast and brush some on the meat as well. Place back in the oven and bake for an additional 15 minutes. Toss the grapes and any additional rosemary in a little bit of olive oil until well coated. Add the grapes to the sheet pan and roast for an additional five to ten minutes, or until the grapes have started to swell and caramelize on one side and the the internal temperature of the meat in the thickest part of the thigh reaches 165°F. Remove from oven and cover with aluminum foil. Let rest 10 minutes, carve, and serve with Alexia Premium Vegetable Sides. If you are using a roasting rack placed inside of a sheet pan, be careful when pouring in the grapes that they don't bounce out of the sheet pan and into the oven. The larger your grapes the more time they'll need to roast. Test the temperature of your chicken before adding in your grapes to make sure that you don't add them too early.